DON'T KNOW WHAT TO GET FOR THAT SPECIAL FAN? We are proud to offer the exclusive Toronto Blue Jays Gift Card. This convenient and exciting gift card is a must for the baseball fan on your list. Redeemable in person at Rogers Centre for Blue Jays game tickets and team merchandise at the Jays Shop Stadium Edition (Gate 1 & 5). May also be used at Jays Shop (Yonge/Dundas - Eaton Centre location) or for tickets at most Rogers Video locations in southern Ontario. 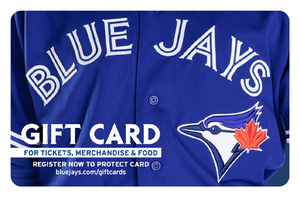 Blue Jays gift cards are also cross-accepted with the The Shopping Channel and Rogers Video All-Access gift cards. They can also be used for food and beverage purchases at select concession stands in the public concourses of Rogers Centre. For further clarity, Toronto Blue Jays and Rogers Gift Cards are not accepted at other Rogers Centre restaurants (e.g. Arriba, Sightlines, Windows, HSBC Club VIP), the Olde Spadina concession stand, luxury suites or at mobile vendors/hawkers. Card is not redeemable/refundable for cash. Please visit www.bluejays.com/giftcard to register your gift card to protect your value. Unfortunately, gift cards are NOT redeemable for online purchases at this time. Also available in $25 denominations.